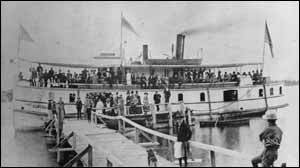 Ogdensburg had a ferry. Waddington had a ferry. Morristown had a ferry. And they were - they were neat. That really was neat. You could buy meat in Canada after the war, and you couldn't buy meat here. And, even during the war, you couldn't, so the girls would go over to Ogdensburg, they'd get on the ferry, go over to Canada, and buy their meat and come back, see. And there was a lotta traffic comin' across that ferry and, when they put the Ogdensburg bridge in, "course they, that was part of the deal that the ferry would go. "The Game Warden and the 'Automatic Shotgun'"
I used to sit in the blind there and my father was so good with those pump guns. He'd, you'd think it was a machine gun. I was right there with him, and he was emptyin' them pumps, you know, and those days the limit was forty four ducks. 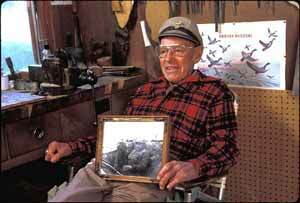 And usually I had forty four ducks and some hid away, but anyway, the game warden was over on Chimney Island, which is a half mile from Ice, listenin' to my father. So he come over and he said, 'I want to see that automatic shotgun with the long magazine.' You know, you could only shoot seven shots in them days, and my old man was spittin' out fourteen, you know. And my father was pretty rough, didn't matter if it was the game warden or who it was and he said, 'You set your little hinder right down beside me, and I'll show ya.' So a bunch of broadbills went over the decoys, and he emptied those two pump guns, and the game warden got up and went. [laughter] I can remember that, yeah. I was always doin' somethin' to needle my father, somethin' wrong. So we had this snowmobile. Did you ever see one with the treads on the back, and runners in the front? Well, we had six bushels of apples in the back. It had a homemade cab on it. And I was runnin' 'er, and we got about halfway out to the island, and there was a heave. That's a pressure ridge, you know. It either heaves up or it heaves down or it goes like this. Well, this one went like this, and my father says, 'Hold 'er. I'll go out and find a place to cross it.' So he went out and he didn't have his sounden', you know, his pole that he sounds with. But he had an ax and he'd tap like this and like this. Cold as hell, and you know snowmobile didn't have no heater or anythin', you know. And I was gettin' sicker and sicker of it and finally I said to hell with him. And I give 'er the gun and I got right where he was and down she went. Fortunately there was only about probably twelve feet of water, and they talk about jumpin out, but they're on the bottom before you're down there, you know. Well, anyway, was he ever mad, because he didn't tell me to come ahead, you know, it wasn't right. So we walked - I went back down. I come up and my sister and my mother was still down there. So I went down and there my mother set like a - like she was, a Canadian, a British-Canadian, you know, like this and her head stickin' out. Because the door, from the door to the top was about like this and there was an air space, see, and she set there just like that and I got her out and got my sister out. And up they come, and we went out to the island and walked. Imagine, soaking wet in that cold. My old man couldn't rest to eat supper. He said, 'We'll load some plank in the hand sleigh and we'll go out. I want to check and see how much water she's in and how we could get her.' So I had to do that. I had to get the planks and he and I and put them on the hand sleigh and went out. And those planks were fourteen foot, twelve inches wide and two inches thick. And we took - I took one hand and he took the other and we walked out over the hole. So we could walk out, and I dropped my end, and the plank went like that, see, down in the water. And I reached right out and got it, and put her up and he walked out on her and his feet flew up in the air and in he went. [laughter] I went and didn't come home for two days. I went up to one of my friends and didn't come back [laughter]. He'd a killed me. I was always doin' somethin' like that, you know. We had the Miss Hazelton, and she had two, seven hundred horse engines in her, and she'd do, back then eighty miles an hour. And the way they worked then was he steered her, and I handled the throttles. And you couldn't hear yourself think, you know, with them twelve exhausts on each side, and the flame, the blue flame goin' right over your heads. And he'd tell me, 'Wad it to 'er,' and I couldn't hear him, you know, with the - I knew what he was sayin'. So we raced 'er and had to go down to the Island with her; that's twelve miles from the Bay, and he leaned over. I knew what he said, and I wadded it to 'er, and the current down there circles, you know, from an obstruction on the bottom, and those v-bottoms with a step in 'em were tricky. And she was doin' about eighty, and she hit that swirl, and she took off and she went over there about fifty feet and hit the water like that, and I let up on her and soon as she straightened up, I give it to her again. That was all right. Everything was wet, and I was settin' in a puddle of water. When I got downtown and got out, by God it wasn't water [laughter].